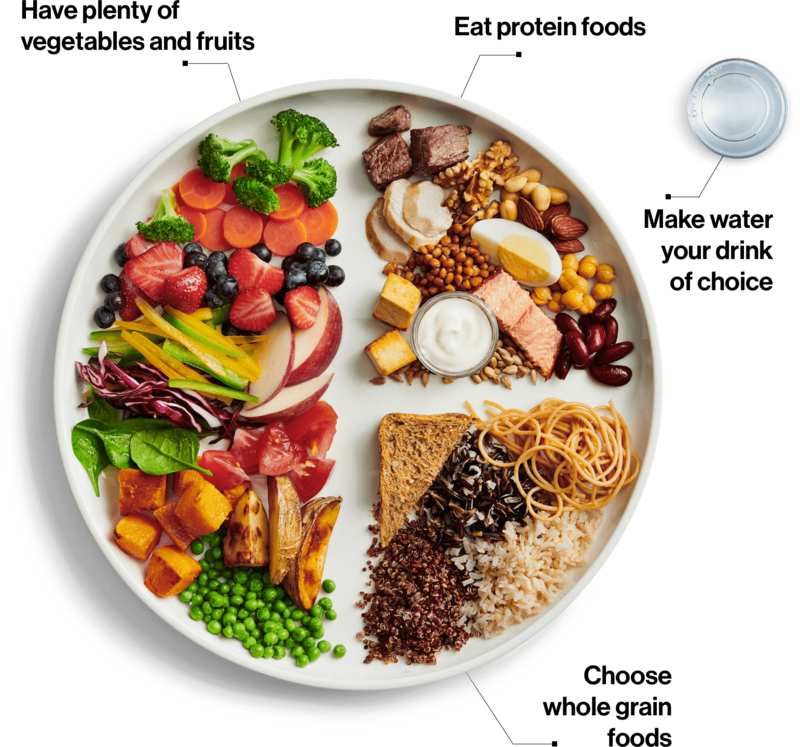 • The 2007 food rainbow with specific serving sizes and numbers of servings has been replaced with a healthy eating pattern; a colourful plate highlighting healthy food choices and eating habits. • The four food groups have been replaced by general categories: vegetables and fruits, protein foods, whole grain foods. Milk and Alternatives and Meat and Alternatives have been combined into the protein foods. • The new food guide is more than just what to eat, it is also about how you eat. It includes messages to cook at home more often, eat meals with others, be mindful of your eating habits and enjoy your food. It also includes information on health risks associated with drinking alcohol. • A focus on vegetables and fruits, whole grains, and low fat proteins with recommendations to choose plant based options such as beans, lentils, tofu, nuts and seeds often. • Recommend satisfying thirst with water instead of sweetened drinks. • Enjoy a variety of foods each day. • Limit highly processed foods such as pastries, candy, sugary breakfast cereals, sugary drinks, lunch meats, and noodle or rice mixes. These foods are high in calories, fat, sugar or salt (sodium). • Choose foods with unsaturated fats (vegetable oils, nuts, seeds, and fish) instead of saturated ones (cream, butter, fatty meat, coconut and palm oils). 1. Now that there is a greater focus on plant based proteins, can I still eat meat and milk products? Absolutely! They may no longer have their own food groups, but these foods are proteins. If you eat these foods, choose lean meats and lower fat milk, yogurt, or cheese. These food choices provide a lot of important nutrients such as calcium, phosphorous, iron and vitamin B12. If you choose a vegetarian pattern of eating, you can still meet your nutrient needs with some careful planning. A registered dietitian can help! 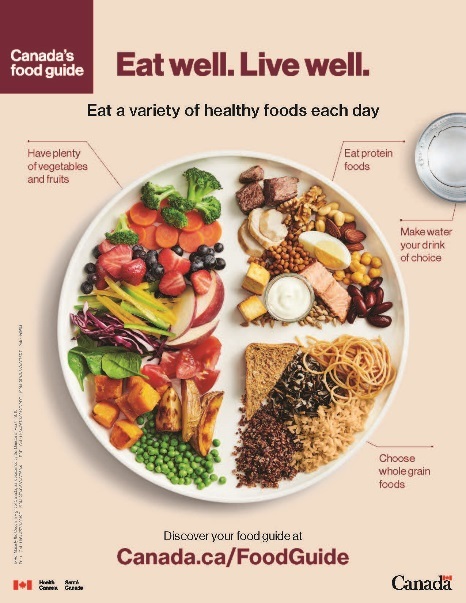 A variety of healthy foods is part of healthy eating pattern and the new Canada’s Food Guide makes it easier for cultural and personal preferences and food traditions to fit. 2. The new food guide recommends water as the drink of choice. How does milk fit now? Water should replace sugary drinks (including fruit juices) to stay hydrated but milk is still a healthy choice, especially for young children. Plant-based beverages such as almond and rice beverages can be used by adults and older children but do not have enough protein, fat or energy to meet the needs of young children. Soy and pea beverages have more protein, but are still too low in energy for use with children under two years of age. 3. Why does the new food guide include messages about how to eat? What we eat affects our health and the food environments in which we live affect what we eat. For example, foods and drinks available at home and in restaurants, schools and rec centres have a big impact on what we choose to eat and drink. Marketing and conflicting messages in these environments and on social media and the internet also make it hard for Canadians to make healthy eating choices. Healthy eating is not only an individual or family choice; it a shared responsibility. Health professionals and policy makers in all sectors and at all government levels can use the new food guidelines as a resource to support program and policy decisions. 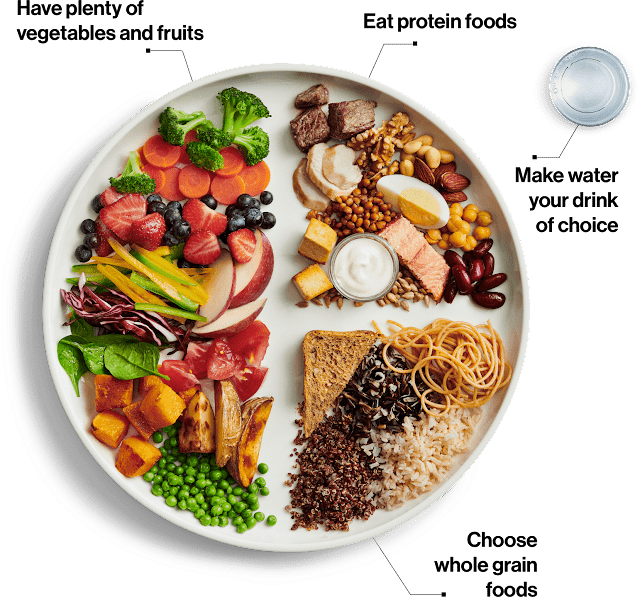 Health Canada will be releasing more resources to support Canada’s Food Guide later in 2019. Dietitians will be here to help translate nutrition messages into everyday advice!